This Chess set was assembled soon after Lego introduced the bulk brick bags in their shop@home catalog. The bulk bags of black & white tiles begged a chess set. 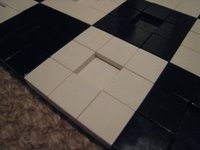 Instead of making a flat board, each square has a depression in its center, keeping the piece in place - See close up image below. The board design was my father's. I designed the pieces sometime later. The Queen uses one of the older flowers for the top, which, sadly, Lego does not make in black. The Pawn uses a plain mini figure head. when I originally designed it, white mini-figure heads did not exist except with a skull pattern. Luckily, not long after, Lego came out with an International Space Station set which included them. The Knight took by far the most time to design. The design I eventually came up with was derived from the horses found in an old yellow Castle Set, which was made before the modern Lego horse was introduced. I took the design for the head, and remade the neck to bend around to the base. One of the best LEGO chess sets I've seen, Jeremy. The playing pieces are simple yet elegant. Very classy with B&W pieces on a B&W board. Kudos to your dad for the board design. Very well done! This is kinda what I was looking at doing myself, but I don't really have the pieces for it. The chess board is a clever design! Very well put together classic look. I like the recessed center to hold the pieces. Quoting Porc Chops i was trying to get a good look at it but i can't quite tell so i'll ask. ;] You mentioned the queen had the white flower atop the piece, so what does the black queen have instead? a 2x2 flat round? Yes, it is (from bottom up) 1x1 round plate (x2), 2x2 round plate, 1x1 round plate. i was trying to get a good look at it but i can't quite tell so i'll ask. ;] You mentioned the queen had the white flower atop the piece, so what does the black queen have instead? a 2x2 flat round? 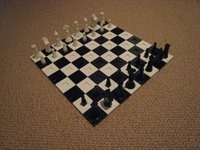 Aside from the rather classical look to the chess pieces, which is fantastic, the board design is brilliant. Now I'm off to check out your website! Very nice job. The attention to detail is excellent, 5/5.